A little while back I got a great question from Kelsey, a Stonesoup reader. Okay, so I live with my boyfriend, and I really enjoy eating healthy (spinach, avocados, beets and goat cheese, etc.) but my boyfriend is really just interested in the meat and carbs in any meal! He won’t eat it if there’s no substantial meat, and I have a hard time finding the budget + willpower to try and make us separate meals. Any tips for balancing the two? Unless you’re cooking for yourself 100% of the time, I’m sure you’ve grappled with the ‘keeping everyone happy’ dilemma at some stage. Even in my house, where we both love most food, there are times when my Irishman and I disagree on what’s going to be delicious. Especially when it comes to ‘Meat-Free Monday’ or eating fish. So over the years I’ve developed some simple strategies to cope with this problem without having to cook separate meals. And the thing is, it isn’t necessarily as difficult as you’d think. The first and easiest solution is to find a meal that will please everyone. So ask yourself what does everyone like? Or what can everyone eat? Part of the problem is that we tend to define allergies or taste preferences by what we ‘don’t / can’t’ eat. So this becomes the focus. Sometimes just changing the way you think about the problem can be enough to spark creative ideas for solutions. 2. Serve with different sides. The next place I’d look for solutions is to find different ways to serve the main component of the meal so that it keeps everyone happy and satisfied. So in Kelsey’s example, I’d serve her main ‘protein’ with steamed veg or a salad so she feels like she’s having a healthy meal. Where as for her carnivore, I’d serve the protein with something carb-focused like the butter beans below to keep him happy. Or say it’s curry night. Kelsey might like to serve hers with some grated raw cauliflower (cauliflower ‘rice’) and steamed rice for her carnivore. 3. Choose a different ‘protein’ or main event. I find this one particularly helpful for catering for vegetarians or vegans. So the carnivores will get their chicken, steak, fish or whatever. And the vegetarians will have some grilled halloumi or omelette, or for a more vegetable focus pan fry some mushroom ‘steaks’ or eggplant ‘steaks’. Then just keep all the accompaniments veggie friendly and everyone is happy. 4. Adjust the quantities / ratios to suit. This may not be helpful in the case of allergies. But when it comes to taste preferences, especially around health, tweaking the quantities can be really helpful. For example, Kelsey might cook up 2 steaks and then rest and slice them. She might then mix up a green salad. Her carnivore would get a large serving of steak with a little salad. And Kelsey would have a lovely big salad with some chunks of avocado and a smaller amount of steak tossed in. 5. Free yourself from rigid recipes. You know how I always include ‘variations’ at the bottom of my recipes? Well, the reason I do that is to open your mind to the possibilities that are out there. I want to empower you to ‘tweak’ the dish so it suits you and your situation. And the thing is it doesn’t need to stop there. I really believe the secret to catering for different tastes and allergies without turning yourself into a multiple-meal-making-machine is to develop the confidence and skills to free yourself from the constraints of rigid recipes. And you know the best way to learn? It’s to take baby steps. And that’s where the blueprint or ‘template recipes’ in my ebook the ‘2-Minute Meal Plan‘ come into play. It includes 63 templates which will give you the confidence and skills to cook more creatively, while still having a basic recipe to follow. To demonstrate how you can ‘tweak’ a basic meal to keep everyone happy, I’ve included 2 different ‘ways’ or options for serving. 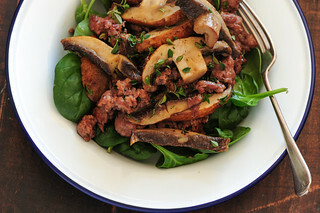 In Kelsey’s situation I’d serve more of the mushrooms to her and pop everything on a bed of baby spinach or other leaves. 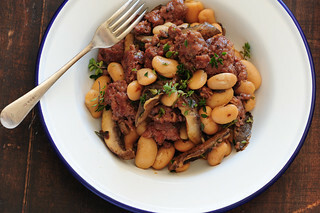 To keep her carnivore boyfriend happy I’d give him the larger share of the sausages and less mushrooms and toss in a can of butter beans or chickpeas to serve. If I were cooking for a vegetarian and a carnivore I’d cook the mushrooms and sausages separately and then serve the beans and mushrooms and spinach for the vego option. And serve the sausages with the beans and mushies for the carnivore. 1. Heat half the butter on a medium high heat in a large frying pan. Remove sausage casings and crumble the sausage meat into the pan. 2. Cook, stirring and breaking up any large chunks of sausage meat for a few minutes or until sausage meat is starting to brown. 3. Add the remaining butter, mushrooms and thyme. Continue to cook, stirring every now and then until the mushrooms are tender and brown and the sausage meat is all cooked through. 4. Taste and season. Serve on a bed of the baby spinach, if using OR add the butter beans, if using, to the pan and cook for another few minutes or until heated through. gluten-free – make sure your sausages are gluten-free or replace with ground (minced) beef or pork (about 450g / 1lb). breakfast / higher protein – serve with a poached egg on top. vegan – replace butter with olive oil and replace sausages with cooked lentils (about 450g / 1lb). Make sure you’re generous with the oil and you may like to splash in some sherry or other vinegar to add freshness to the lentils. The cooked lentils can be added after the mushrooms are cooked and just heated through. vegetarian – replace sausages with lentils as per the vegan recipe. Use the butter. paleo – serve with the spinach not the butter beans. different greens – any washed salad leaves will work here. Or you could try wilted greens such as kale, collards, spinach or chard. Also lovely on top of a bed of steamed broccoli or broccolini. different carbs – I’ve used canned beans because they’re super quick and relatively healthy. But you could serve on hot buttered toast, a bed of mashed potatoes, with cooked pasta or couscous or even steamed rice. ps. 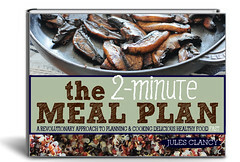 Wondering if the ‘2-Minute Meal Plan‘ will help? Always a balancing act, but these are great suggestions. I find that working with different sides works for our family. Instead of putting everything in the sauce, I keep the questionables (i.e. the meat) on the side and let the individual decide what to mix in. This works great for rice or pasta meals. Love your suggestion… there’s definitely something to be said for letting everyone decide for themselves! This is just lovely all around. And the EXACT question I would ask–I love veggies, boyfriend is all meat n’ potatoes. Sigh. But these are awesome tips!! You’re definitely not alone there Ashley!